Infinite ROE and... negative ROE? Hi. Greetings to all the people. Today in the radio club a colleague took instruments and tested a device similar to a quad antenna, with a two-wire cable forming a square. It is a telephone cable, which complies well with the 2.4 mm separation between the two conductors, a design condition.The side of the square measures 33 cm. In the shops there are displays of products made of plastic, measuring 33 cm on each side. On one of these, with a glue gun, the bifilar cable was arranged, with a particularity. We take the cable and cover two sides. That is, we start at vertex 1 of the square and we arrive at the vertex 3. 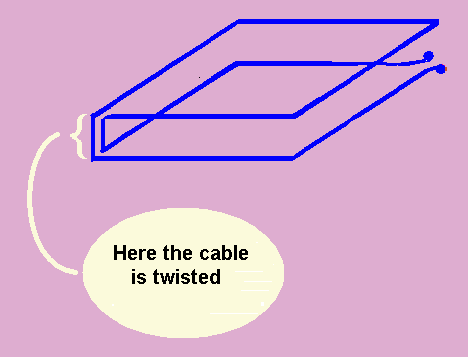 There we stop and, just where is the vertex 3, we twist the cable half a turn, so that the thread A passes to the position that the B had and vice versa. After that we cover the remaining two sides, thus returning to the vertex 1. Now we have 4 cable tips where the vertex 1 is. You have to weld two together, to leave two free ends, which are the terminals of the device. We do not choose at random the two points that will be welded together. We choose them so that after welding the bifilar wire is equivalent to a single wire that turns two times. This is easy, because the wires that are welded have remained on the same side, that is, both in position A, or both in B, as we have named the positions. The test was done with an instrument that measures ROE, power and some other properties. The colleague who brought the instrument and made the measurements lives on electronics since 30 years ago and since 20 years ago he has personally built, measured and tested almost everything that makes up his radio ham station. He is constantly consulted by all colleagues regarding all radio and electronics topics in general. We can trust what it measures and what it says. His name is Hector. The test was made in the frequency corresponding to the center of band of 2 m. Hector made me see the instruments while measuring and explained each measurement. In conclusion, he said that this device, in that frequency, gives a reflected amplitude greater than incident. He talked about infinite ROE. And I thought that if the reflection exceeds the incident, the ROE should be negative. Questions. Are infinite ROE (as Hector said) and negative ROE (as I thought) possible?